Happy New Year. Come and join us in Comrie Community Orchard, Cultybraggan Camp, this coming Sunday – 7 January – 11 am to 3 pm. 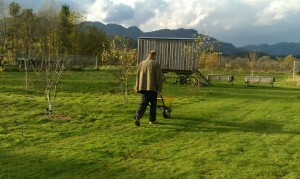 We shall be starting the pruning of the apple and pear trees. So far the weather forecast suggests a dry, sunny day. Join us for a snack lunch in our cosy shepherd’s hut.